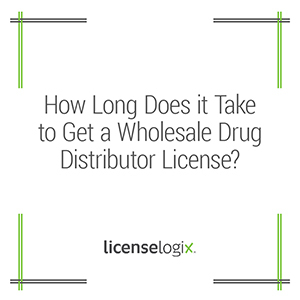 Wholesale Drug Distributor Licensing: How Long? The licensing process for Wholesale Drug Distributors varies significantly from state to state. States, along with the federal government, have an interest in maintaining the availability of safe and effective drugs for public. Depending on the state, licensing approval timelines for Wholesale Drug Distributors range from weeks to months. Let LicenseLogix streamline the process for you by providing comprehensive research to ensure that all of your licensing requirements are met. All fifty states require Wholesale Drug Distributors to obtain a license before they may engage in any wholesale drug distribution activities within the domestic state. The procedures that each state follows vary, and the more information required by the state, the longer the process may take. Most states require background checks, submission of facility floor plans, proof of insurance, disclosure of all operating officers, and surety bonds for liability purposes. In states like Alaska where the licensing requirements are fairly straightforward, a business may obtain its Wholesale Drug Distributor License within two to three weeks. However, in states such as California, the process may be far more tedious, requiring not only the basics, but also requiring the Wholesale Drug Distributor to obtain approval by both the FDA and DEA. A handful of states also require VAWD certification by the National Association of Boards of Pharmacies, or a similar entity. In states requiring additional certifications, the processing time may range from one to three months. Furthermore, should a Wholesale Drug Distributor choose to expand into another state, the licensure process must be recommenced in the new state, resulting in additional processing time. Failure to comply with licensure requirements for Wholesale Drug Distributors may result in civil and/or criminal penalties at both the state and federal level. LicenseLogix assists with license compliance by making sure Wholesale Drug Distributors stay up to date on licensure requirements, filings, and renewals so you can focus on growing your business. We will complete all applications on your behalf both efficiently and accurately, and ensure that your licenses remain up to date. Give us a call today!